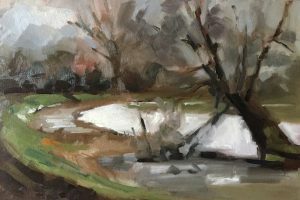 Here’s a quick post showing the plein air paintings I completed during the very short burst of cold weather we’ve recently experienced. These mark the first time in many, many months that I’ve ventured outside to paint. I find it so difficult outside of the studio – but I also know that I just need to practice more. Such is the lure of a snowy landscape that fear of failing was outweighed by just wanting to get out there. I didn’t stray too far from home, and only spent around an hour on each painting. 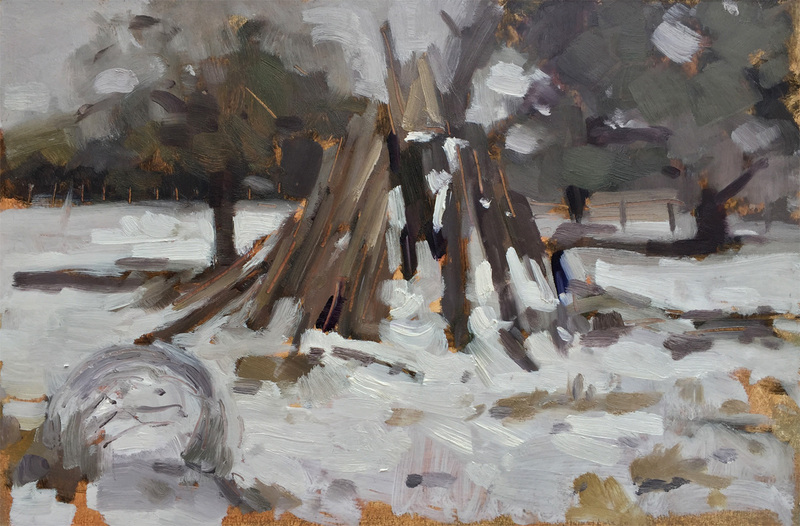 The first was made at the start of the thaw and is of a pyre built in some scrub land at the back of our house. I first painted this maybe 5 years ago. So much wildlife lives in it now that if we don’t want to cremate any little creatures, we’ll have to take it apart and rebuild it if we ever decide to set light to it. It’s not really a very inspiring view, but there’s something about it that I like, and as rough as it is, I quite like the painting too. The second painting I made the following day when the snow had mostly disappeared. I found a bank along the disused canal in the village where a deep drift meant that a covering still remained. I liked the sweep of the bank and path, but I was way too ambitious. I had no idea how to tackle all the muted colours, incredibly similar in tone, or the brushy reeds and branches free from leaves. So, I’m less pleased with this one, but I’m left with the feeling of invigoration that I got from giving it a go. You can’t beat fresh air, bright light and a sense of achieving something… anything.